[Update:] See some related thoughts about the subject of why Japanese people in Japan don't get that fat here. 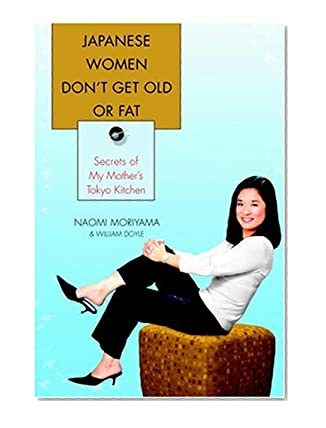 I stumbled upon Japanese Women Don't Get Old or Fat when I was browsing around Amazon some time ago. When I first read the title, I laughed. It seemed like a quite obvious attempt to cash in on the success of French Women Don't Get Fat: The Secret of Eating For Pleasure. Also (and this applies to the French Women book too) it makes such a sweeping generalization right there in the title, which borders on the ludicrous. But I was curious about it so I decided to get it for the sake of research. The short review: it's not as bad as I thought it would be, and may serve as a good introduction to Japanese cooking, though definitely not the best. Don't overeat - observe the hara hachibunme rule (eat until you are 80% full). Hara hachibunme is a common Japanese term: it appears also in a book I reviewed previously, Hungry Planet,, in the Okinawa chapter. (Okinawa has the most longevity of anyplace in the world.) Another term my mother likes to quote to me quite often is hara mo mi no uchi - your stomach is a part of your body. In other words, don't overeat! Eat a lot of fresh vegetables. Eat more whole grains - eat brown rice rather than polished white rice. Eat fruit for dessert, or small portions if you must have cake etc. Obviously, it is not necessary to eat Japanese food to accomplish these goals. But I do agree with the point made in this book that traditional Japanese food is inherently healthy. As you probably know if you have been reading this site, I am Japanese but have lived most of my adult life in other countries. So my everyday cooking is a mishmash of various styles. If I could afford to in terms of both time and money though, I would cook and eat Japanese style most of the time. Traditional Japanese food centers around rice (gohan, which is also a synonym for a meal), with small portions of okazu, savory things that go well with the plain rice. A typical Japanese dinner would have, besides the rice, 1 small bowl of soup (miso or clear), 1 protein dish such as grilled fish, and 2 or 3 other mostly vegetable-based side dishes. A popular dietary guide in Japan that has been around for decades is to try to eat 30 kinds of food items a day for nutrional well-roundedness. This may sound impossible, but in Japanese cooking it's not that out of reach. If you go to France, most women are not overweight. Many, especially in Paris, are in fact skin-and-bones slim. What may be less known is that here in Switzerland too, there aren't many overweight people - though older women tend to look more sturdy and well-muscled. Whenever I go to the U.S., or for that matter to the U.K. too, I always get a mild shock when I see the number of very overweight people. You simply don't see many of them here. Swiss food is a mix of French, German, Italian and native Alpine - featuring loads of butter, cheese, bread and potatoes. Veal is the most popular meat, especially for company (chances are if you are invited to a Swiss home you're going to get veal in some form). So why aren't more Swiss people overweight? The answers I think are the usual: moderation and exercise. Portions here are quite small compared to those in the U.S. The delicious pastries available at Sprüngli are barely bigger than my palm, and their handmade truffe du jour is so rich that one (and yes, they do sell them by the piece) is enough to satisfy any chocolate urge. Swiss people also exercise a lot. Whenever we're invited to someone's house, invariably we go for a walk after dinner to stretch our legs and to see the neighborhood. The house I live in is on a corner, and I always see couples and families walking or biking past on the weekends. And of course a lot of people participate in winter sports as well as hiking and camping in the summer. What's the typical after-dinner-party activity in the U.S.? Watch TV, play video games, or just sit around and chat and snack some more? Getting back to why Japanese women aren't overweight: I discussed this with some Japanese people and we all seem to agree that in Japan, there is a lot of societal pressure to stay slim. Young girls often starve themselves so they can be fashionable. Older women are also quite pressured to stay thin. The standard clothes size in Japan is junior size 11, which is about a size 6 in the U.S. Japan is inherently a comformist society, so it's difficult to 'stick' out in any way, including being overweight. As far as Japanese women not getting old - they do of course. Do they look younger than their Western counterparts? Often yes, but I think that all Asian women tend to look younger than European-Caucasian women. I still get carded in American bars and I'm nowhere near 21 anymore. As far as the various illnesses related to getting older, while the incidences of heart attacks and diabetes may be low, there are other problems such as a high incidence of osteoperosis amongst older women. So to wrap up, I would recommend this book if you want once with some nice recipes (though without pictures) of some basic Japanese foods, with some diet advice along the way. But don't buy into the premise that there is some magic aspect to Japanese food. If you overeat it, you're still going to gain weight! The main lesson to be gleaned from it is hara hachibunme. Submitted by maki on 2006-01-20 15:31. In Canada we do not have a lot of after dinner strolls simply because it is cold enough to kill you 10 out of 12 months of the year. Our supersized caribou meal packs a wallop, but we need those calories until we can brave the cold again! I propose the Canadian Diet: How to live on Tim Horton's coffee and Kraft Dinner. My Mother-in-Law gave me this book for Christmas and I am reading it now. BTW, I have your site in the sidebar of my personal blog! I am a fanatic of all things Japanese, living in Toronto, Canada. I have a separate Japanese pantry for these staples and I just love all those pretty small dishes used for serving. I went to Japan in 2002 and it was an amazing experience. Can't wait to go again. There's an interesting book called "Losing It" by Laura Fraser, which talks about the diet industry in America. Part of her thesis is that there's something about diet food itself that leads to gaining weight. Apparently the body knows the difference between fake fat/sugar and the real thing, even if the mind manages to fool itself. That, and the way we've convinced ourselves that if it's "low-fat" or, lately, "low-carb," you can eat as much as you like; it's "good for you." So, for instance, people will eat whole boxes full of SnackWells, those awful little chemical-tasting, strangely-textured cookies, because ultimately *they don't satisfy. * Not bodily, and frankly, not aesthetically either, though we may try to convince ourselves otherwise. I think part of it is the weird twists and turns our Puritan legacy left us with. Very few people will say outright that "gluttony is a sin," or "pleasure in food is worldly and against God," for instance. But the fashion for extreme thinness has a lot to do with the anti-sensual mindset, even if the super-skinnies pout and posture in skimpy clothes. Fat represents self-indulgence, softness and laziness, which we still tend to think are bad things at some level (even if surface advertising seems to say just the opposite). And then we tend to put way more emphasis on quantity than quality. Sensual abandon is bad; but *also,* bigger/more is better. Combine all that with the fact that we're mostly a car culture and that many of us tend to work much longer hours at desk jobs than our European counterparts (that puritanism again), which means much more sitting and much more resorting to half-consciously scarfed fast food in large portions, and it's no wonder we're so fat. And then beat ourselves up about it with impossible standards for thinness. Membership in the Elect will ever be just out of reach, but always desirable. signed, also fat but trying to at least not beat herself up about it. Interesting post on Why Japanese women are so slim & look so young for their age. However, being from India, I am not able to differentiate between a Japanese, Chinese or Korean. Any tips ? Apart from good eating habits, I think the Japanese use very little salt & spices in their food. This must surely have a good effect on their health. Ken, every Canadian raves about Tim Horton.. I will have to try it when I get up there next time. Lazysusan, I don't really think you can just look at a Chinese vs. Korean or Japanese person and say they are one or the other since ethnically we are all related (though some people, mostly of the xenophobic type, claim there's a difference). Also, actually Japanese cooking does use a lot of salt and salty foods and condiments..one of the not so good aspects of Japanese food. Belle -- Damn, I am going to start eating more! My grandmother is 70 and she is very healthy, her weight has stayed almost the same for the past 30 years. We are a chinese family but we have adopted many japanese cooking techniques and ingredients into our daily cooking. I would like to share it if anyone of you is intereste. We basically cook dinner by steming or "boiling" it, little oil is used when cooking dinner which will greatly reduces the calories ande fat! Very good way to maintain your weight. Our dinner tends to be vegetable oriented. So it does sound boring to have dinner with mostly boiled veggie but the trick here in making a nice dinner with veggie is to have an excellent soup base. A bowl of delicious and hot soup base with fresh vegetables is really satisfying and filling especially if you had a big lunch for the day already. There are many instant, natural extracted seafood soup base powder available that are made from Japan. They are excellent to use when you are busy or tired after work but still want to have a healthy and tasty vegetable soup for the night! Try to enjoy a night or two of veggie dinner in a week and you'll know the difference! That's the eating routine for my grandma for the pass 30 years and for sure, she's healthy and "well in shape". I really enjoyed your post. I've recently bought this book and I'm grateful for you dispelling any misconceptions I had about the title! I flicked through in the bookshop and was interested to read that the Japanese diet is mainly vegetable and rice based. If, after reading this book, and trying some of the recipes, I find that I like them, I'll probably start exploring some Japanese recipe books for fun and experimentation. This will all be very new to me because I'm Jamaican and our diet is quite meat based I would say. I picked that book up at the airport recently and it was a very good read. I am very pleased to see your review of it. The book is a bit over the top sometimes but, as you say, it's basically sound. What book(s) would you recommend to start Japanese cooking? My only knowledge came 10 or 15 years ago when the BBC had a wonderful series of programmes on all aspects of Japan and I got interested in miso. Moriyama's book is quite good at giving some ideas on how to get started, although it's organized more for reading through and the important stuff is scattered around. But I just saw you recommend a book by Emi Kazuko, so my question is answered. Margaret, hopefully you can find some ideas for getting you started on Japanese cooking on this site also. I am planning to organize the information here a bit better to allow people to find things easier. Hi, I'm French and I live in the States...I found your blog looking for recipes and I like it!! I left France to work here in California, didn't change my diet, and gained 20 pounds...Until I understood I had to switch to organic only. Now I'm loosing weight. There is something weird with the food here, it's not only a dieting problem. I think you're right about not to overeat. But I have a question...is it bad to miss meals? I am not a medical professional, but the conventional wisdom is that skipping meals can sabotage any weight loss efforts since it slows down your metabolism. You're right - I have also lived in Switzerland, and there are indeed very few fat people (though definitely some strong, sturdy looking people - however, they are completely incomparable to the larger or obese people I see in my native Brisbane). I spent 18 months eating cheese, potatoes, lovely breads, and delicately presented little sweets. However, I did not gain any weight, and my physical fitness level was much higher than what it normally is in Australia. It was normal for us to spend Sundays in Summer biking around the country side, or in winter, walking/hiking, sledding or skiing. I was making a 12km round trip on my bike to the Kantonsschule every day. Anyway, in conclusion, I have just discovered your website, and I am really enjoying reading it. Thanks!